Individual player will get light breakfast, driving range, golf, super ticket and lunch. 2 Golf Players. Each player will get Light breakfast, driving range, golf, super ticket and lunch. 3 players. Each player will get Light breakfast, driving range, golf, super ticket and lunch. Closet to the Pin sponsor, you get a team of 4, Each player will get Light breakfast, driving range, golf, super ticket and lunch. You should provide swag for 100 people and be responsible for prize to the winner. Looking to supply drinks at your hole and offer free drinks? It is simple as paying a small fee and you can serve as much as you want. This covers the course corkage fee and one day license. 4 players. Each player will get Light breakfast, driving range, golf, super ticket and lunch. As Hole In One sponsor, you get a team of 4. Each player will get Light breakfast, driving range, golf, super ticket and lunch. You should provide swag for 100 people and be responsible for prize to the winner (we can help getting the insurance if cash prize is offered. All hole signs will have your logo at the bottom. Hole sponsor, team of four players. Each player will get Light breakfast, driving range, golf, super ticket and lunch. You should provide swag for 100 people. As Longest Drive sponsor, you get a team of 4.Each player will get Light breakfast, driving range, golf, super ticket and lunch. As Platinum sponsor, you get 2 teams of 4. Each player will get Light breakfast, driving range, golf, super ticket and lunch and hole sign. As Putting Contest sponsor, You should provide swag for 100 people and be responsible for prize to the winner. As Straightest Drive sponsor, you get a team of 4. Each player will get Light breakfast, driving range, golf, super ticket and lunch. Each player will get light breakfast, driving range, golf, super ticket and lunch. $2000 be able to welcome to everyone to lunch, 1 team of 4 players, make any announcement or placement of items on tables or bags. You should provide swag for 100 people and be responsible for prize to the winner. This is our 7th year supporting All Children's Hospital Guild. 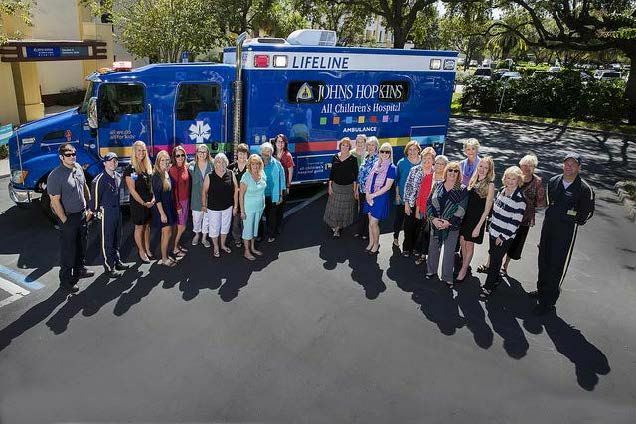 Our support has raised over $55,000 benefitting Johns Hopkins All Children’s Hospital through the All Children's Hospital Guild Seminole/Largo Branch. This is our 7th year supporting All Children's Hospital Guild and through our event this year, we will be able to help ACHG reach their four year goal. The Guild members are working on their third year for their pledge of $1,350,000 toward Johns Hopkins Nursing Excellence Program and a new pediatric ambulance to support the Transport Team. This is the first time that the Guild is taking on two worthy areas of the hospital in one pledge. Funds raised for Johns Hopkins Nursing Excellence Program will be used for education, training and additional certification. Highly trained nurses are crucial in meeting a standard of excellence in care. Across the nine Branches, Guild members live in several counties in the Tampa Bay area. They recognize the need for specialty ambulances that can safely transport young patients from long distances to Johns Hopkins All Children's Hospital. In addition to the overall pledge commitment, each Guild Branch has a Legacy Fund in which monies support timely and urgent needs of the hospital and the Johns Hopkins All Children's Hospital Outpatient Care locations. This includes research funding, program or clinical support, and advocacy or education support. The Guild also manages the Love Lights program, donations made in celebration of a loved one. Proceeds from this program support all their pledge goals.